Yesterday I had the great privilege of attending Rachel’s wedding, helping her get dressed in her custom gown, and celebrating the beautiful day she and her loved ones shared. Now that the wedding day is past (and she succeeded in surprising her fiancée with the design) I can share photos with you all! But you’ll have to wait a bit for pics of the completed gown – I’m going to take you through the custom creation process with me first. During our initial conversations, Rachel had imagined an A-lined, mid-calf length, strapless gown for a beach side wedding. But following her friend Maria’s wedding (where Rachel was maid-of-honor), Rachel discovered a newfound fondness for ballroom style gowns – Maria’s had been stunning, she told me. Meanwhile, Rachel had felt out her fiancée Dan to see his thoughts on a shorter gown, and he expressed a strong preference for something full length. The final factor that made her rethink her original designs – and this was not a small shift – was that after viewing a number of locations they decided against the beach and picked a completely different venue. Instead, they were married under the spreading branches of a majestic oak tree at Cross Creek Ranch in Dover, Florida, with the reception in a refurbished open-air stable on the site. The site had a Southern, country, old Florida feel to it, and it meant a different theme for the wedding day than their initial ideas. So Rachel wanted a fuller, longer skirt and a more formal feel for her gown. She also had begun to rethink having a strapless gown and expressed that she was open to other suggestions if I had any recommendations. Finally, Rachel had mentioned from the start that she wanted her gown to have purple accents. Each time we spoke, she brought the color purple up again – it’s her favorite color, and it was clear that she really wanted to include it. But she mentioned, almost offhandedly, that she didn’t want there to be “too much” purple, and I couldn’t tell whether she had a preconceived preference for how much was too much, or if she just had a vague sense that wedding gowns were supposed to be primarily white. So, for our design consultation, I tried to gather a variety of images to discuss different design elements. Among them, I looked for multiple examples of colored gowns – from the all-white dress with a few purple beads or floral accents, to gowns that had colored trains, colored sashes, colored bands of fabric along the neckline, to those entirely in color without a bit of white on them. As we sat and reviewed the options, Rachel was very surprised to see bridal gowns in full color that still somehow looked bridal, and she was clearly excited to consider a colorful break from the all-white tradition. She particularly loved a photo I showed her of a quincinera dress which had a fitted lavender bodice leading into a lavender overskirt gathered into pick ups over a white satin ballgown skirt. 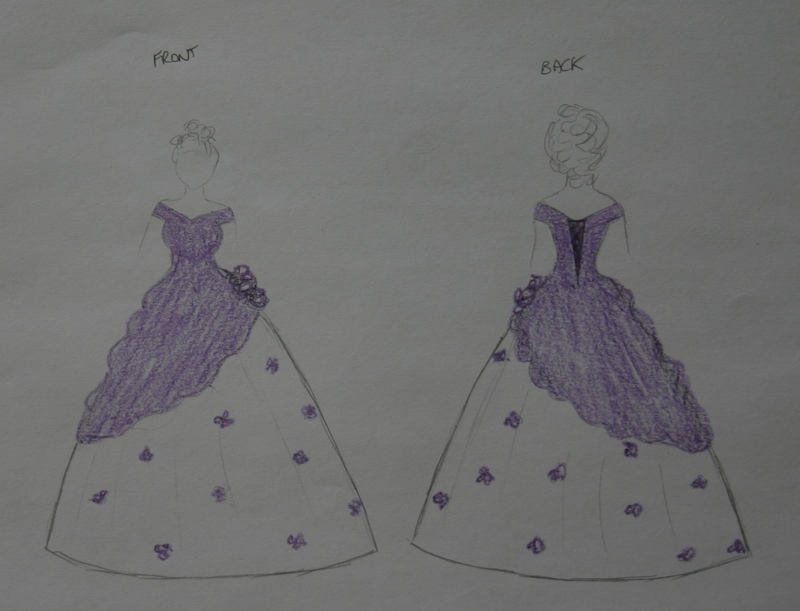 Her gown would, of course, be purple rather than lavender, and she didn’t particularly care for the enormous bow spilling down from the hip or for the embroidery through the skirt, but the amount of color and the pick ups were really exciting to her. I’d also gathered multiple photos of different necklines and closures to show her some of the possibilities, and I was delighted when she expressed fondness for the neckline I’d hoped to recommend as my favorite for her – an off the shoulder strap and a laced up corset back. Rachel has a full bust and it was important to her that this not be the focal point of her gown. I let her know I thought a well positioned off the shoulder strap could really help to balance out her bust and to lift the eye up towards her face. (On the other hand, I suspect a strapless gown, especially if it were cut straight across the top, could easily have made her bust look wider). Rachel also still really loved the floral accents on one of the photos she had first shown me – purple fabric flowers dotting the gown. 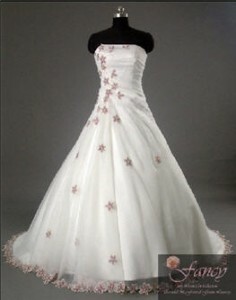 And so we decided to use some small flowers through the ivory underskirt on her gown. Once we had the main elements decided upon, we went over the color in more detail. There are so many shades of purple – from a bluish violet color to burgandy that is as red as it is purple. The right shade was going to really matter – their shift to the ranch venue had been accompanied by a stronger autumn influence for the theme and decor at their wedding. And this meant that whichever shade of purple we chose was going to be accompanied by orange accents: pumpkins on haystacks outside the stable, orange and purple floral arrangements. Rachel was excited but also nervous, not wanting the colors to clash. I pulled every length of purple fabric in my stash, regardless of the type or fiber content, and we compared the colors to an orange swatch to find a shade that seemed to work well. We held the color up to her face, her hair, to make sure it was flattering to Rachel herself. And then I cut a swatch of it for each of us to have when searching for just the right fabric for her gown. We also compared our preferred purple to swatches of white, ivory, and cream colored fabrics from my stash, since Rachel wasn’t entirely sure what shade she wanted. Ivory was the best color with the purple, hands down, and since she’d been leaning slightly towards ivory to begin with it was decided easily. After all of these considerations, the result was a design that was very different from her original thoughts, but really ideal for Rachel’s figure, personality, and wedding plans. I put together a new sketch for Rachel that evening to be sure we were understanding each other well on all the details. We were both simply giddy and I could scarcely wait to begin working on the dress! A new name and a blog giveaway! It was suggested to me in a recent reader comment that I go ahead and name my dress form. I have to agree, the dear deserves it with all I put her through. So I’m opening up the floor for suggestions! I’m sorry I’ve posted so infrequently this week. Work has been busy, home has been busy, and my sewing attempts have not been photograph worthy. On Monday I stayed up until 1:30 a.m. working on Shawn’s shirt, only to discovered that I *hadn’t* solved the crooked-button-flap issue, I had just sewn the thing off center on the opposite side! Aaaaaaaaargh! And of course with a slit cut down the front of the shirt I couldn’t just unstitch and resew, I needed at least enough new fabric to replace the shirt front. Very, very frustrating. But we move on. Yesterday was a fabulous day! I received lots and lots of fabric, which is delightful and definitely photograph worthy. First off, I found the time to head to the fabric store and pick up more fabric for Shawn’s shirt. I also got far enough last evening to confirm for once and for all that I have finally figured out that darned button and collar issue, and I have a nice, not crooked shirt front to work with. I hope to finish his shirt today and post completed pictures soon. I also received a package in the mail of fabrics I’d picked up on clearance at fabric.com. 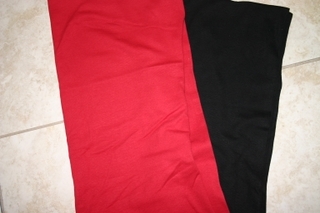 It was 30% off the clearance goodies, so I got these three fabrics for something like $1.37/yard (plus shipping). I plan to make a little nightie out of the pink lace, a dress out of the fruit print fabric, and I haven’t decided about the other lace (which the website said was lavender, but I think looks far bluer, decidedly periwinkle). Last but not least, I recently won a giveaway from a fellow blogger, and the following stash from her arrived yesterday too. Thanks, Diane! My husband is *especially* excited about the cookbook. 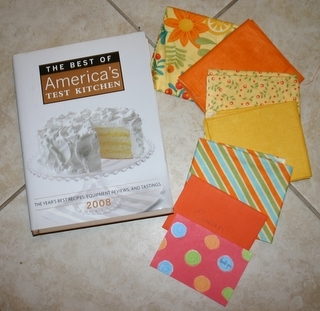 I haven’t yet decided what I’ll do with the fat quarters she sent but I’m sure I’ll think of something. Well, it’s time for Shawn to get a turn with the computer, and I should really get back to sewing. I’m thoroughly enjoying my day off so far. No errands, no guests, no hospital trips. Just peace and quiet and a sewing day at home. I made a bit more progress on the dress yesterday; cutting out the fabric for the outer dress and beginning to sew it all together. I also, on a whim, took the two chiffon skirt layers and pinned them up to the dress form to assess what the finished dress will look like. Unless I add another layer, it will be see through (which might not be entirely appropriate for Bonnie to wear to public performances!). Chiffon is a sheer fabric, and I knew this, but I had expected that the lining underneath would provide enough coverage. With the fabric layers all draped over my cutting table, it looked like I was right. But, hanging on the dress form where the light can shine from behind, it’s clear that the lining is not sufficient, so tomorrow I’ll hit the fabric store for a little more satin and put a layer of satin beneath the chiffon. In the meanwhile, I have the bodice pieces sewn together and I’ll spend this evening hand sewing the bra cups in place.